As of October 2008, customers wishing to have regular paving installed over their front gardens will be required by law to apply to their local council for planning permission. This may cost £150 and could take approx 8 weeks for a decision. The reasoning behind this is to help ease the burden on the sewerage systems at times of very heavy rain. There are other solutions that do not require the permission to be paid for & granted – consider aggregates like crushed slate. More information can be found on the planning portal. Glasgow Kelvin College is delighted that it has managed to lever-in significant match-funding towards its East End Community Garden project which is being developed on the vacant land behind the East End Campus building. Almost £14k of funding has been received from The Levenseat Trust and EBScotland to help create the amenity site which will be open to students, staff and the local community. Not only will everyone be able to benefit from being ‘out in the fresh air’ but the garden will feature raised planters, ground level plots, a toolshed, a polytunnel for propagation and will be fully accessible. 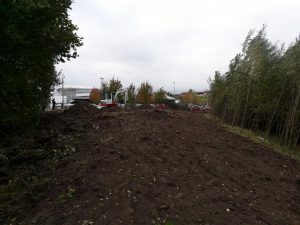 Trees will be planted and the College intends to provide workshops and skills-based classes to community residents and local housing association tenants to help them develop skills and make the most of their communal areas. This will also support a healthy eating and nutrition programme. In addition, produce from the garden will be put to good use by the Hospitality & Catering department. It is anticipated that work will be finished by March 2019 with an official opening being planned for late spring/early summer next year.